Arvid Rosengren is one of the most merited sommeliers in the world, holding a range of competition wins and titles, the crowning achievement being the 2016 A.S.I. Best Sommelier of the World, a competition held every three years for candidates representing sixty countries. It tests theoretical knowledge, blind tastings of various beverages and practical service skills. Born and raised in the south of Sweden, Arvid initially studied Nanotechnology Engineering but figured out half-way through that working with his true passion – food and wine – would be preferable to wearing a lab coat. After a brief time in Stockholm and a period at the Hotel du Vin in the UK, Arvid settled in Copenhagen, Denmark, where he spent the next six years growing from the floor sommelier of a busy restaurant to wine director for an ambitious group of almost a dozen establishments. Arvid was born and raised in Sweden and initially studied Nanotechnology Engineering, but decided to change his career path to food and wine. He has worked at several of the world’s best restaurants in Stockholm, Copenhagen, Britain and New York City. What was the first wine that grabbed Arvid’s attention? Why did Arvid decide to leave engineering and become a sommelier? What is Arvid’s favourite failure from his wine career so far? Why did Arvid work with an acting coach to help him prepare for the 2016 Best Sommelier of the World competition? Does Arvid do any sort of meditation? What was Arvid’s experience at the 2016 Best Sommelier of the World competition like? How has training for the Best Sommelier of the World competition helped Arvid in real-world sommelier settings? What is Arvid’s opinion on the best food and wine pairing? What are some classic food and wine pairings? How did Arvid prepare for the Best Sommelier of the World exam? What was Arvid’s experience with the spirits portion of the competition and dealing with palate fatigue? How should you approach a restaurant wine list? What is the significance of the name of Arvid’s restaurant, Legacy Records? What are Arvid’s top two tips for picking wines from a wine list? What are Arvid’s thoughts on natural wines? What are Arvid’s favourite wine gadgets and how does he use them? Welcome to episode 19! We’ll be chatting with Arvid Rosengren who won the World’s Best Sommelier Competition. He’ll be sharing what it was like to compete in that gruelling competition along with his best tips on choosing from a restaurant wine list and pairing food and wine. I’m so glad that you enjoyed that episode Alan, and thank you for sharing it with your club! I’d love to hear back from them as well. I’ll continue to give a shout to others who’ve been kind enough to post a review on Apple podcasts, social or email, so if you want me to mention your website or social media handle, please include that in your review, along with your name. Now, back to this episode. 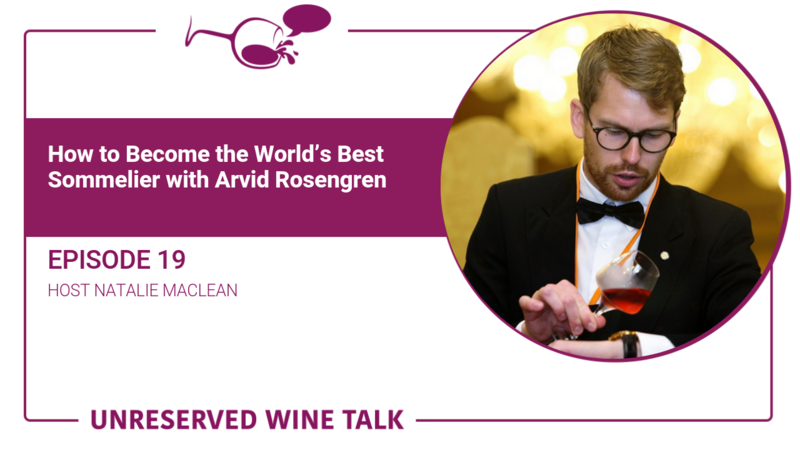 You’re going to enjoy this chat with Arvid Rosengren who is smart, passionate and completely devoted to the world of wine. Enjoy! You can also watch the video interview with Arvid that includes bonus content and behind-the-scenes questions and answers that weren’t included in this podcast. I love how Arvid found a way to combine to seemingly disparate worlds, nanotechnology engineering and wine through his twin passions of figuring things out and nurturing people. Arvid challenges us to reexamine our preconceived notions of certain wines, especially when someone has cared enough to put them on a wine list. Look for the weird wine sections and ask the somm or server about those wines. Also search for wines from regions not known for them such as a zesty white wine from southern France, better known for its big reds. That same concept applies to a wine producer: look for second wines like a grape they’re not famous for, he used the example of brunello versus dolcetto. I never thought about how temperature can throw off a wine and food pairing, such as the chill of the ice cream making a sauternes taste less sweet and more alcoholic. You gotta love his suggestion for decanting bottles larger than a magnum – keep it real and bring out the garden hose! You’ll find links to my wine reviews as well as to the wine gadgets that Arvid mentioned in the show notes at nataliemaclean.com/19. What was your favourite tip or quote from this episode? Share that with me on Twitter or Facebook and tag me @nataliemaclean, on Instagram I’m @nataliemacleanwine or use the hashtag #unreservedwinetalk. You’ll also find links to the social media channels for both Arvid and his restaurant, plus bonus tips for this episode at nataliemaclean.com/19. If you liked this episode, please tell a friend about it. My podcast is easy to find, whether you search on its name Unreserved Wine Talk, or my name. Finally, if you want to take your ability to pair wine and food to the next level, join me in a free online video class at nataliemaclean.com/class.